What is packing credit in exports? How does packing credit help exporters? Is packing credit meant for only packing of export goods? How packing credit is be disbursed under exports? How to avail packing credit by Exporters? Packing credit is nothing but a pre shipment finance given to exporters with a law interest rate to boost exports. Packing credit is given by authorized bank by the instruction of Reserve Bank as a government policy to promote exporters to earn foreign currency to strengthen financial status of a country. 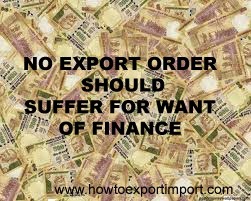 As per Reserve Bank by the instruction of Government, no exporter shall suffer for want of fund for exports. Government promotes all exporters to earn foreign exchange and extend maximum support to encourage exports. Packing credit is a pre shipment finance given by bank to procure raw materials and arranging goods ready for export. Banks provide packing credit against the stock of raw materials or finished goods also in certain cases. The packing credit is a separate finance given to exporters not connected with any limit of other loans given by bank. A separate packing credit loan account is opened for each exporter separately if needed. Once the amount of shipment received from the overseas buyer, the said packing credit amount will be adjusted by bank and close the loan under the said export order. In order to obtain packing credit facility, the exporter has to approach their bank with export order. Bank official visits the exporter’s factory and get convinced on the sock of goods and assess the value with export order. Packing credit loan is one of the best financial assistance by bank to promote the export trade. I have written a detailed article about Packing Credit explaining - The purpose of Packing credit in export business,Who is eligible to get Packing Credit in International Business,Purpose of releasing Packing Credit to Exporters,How is Packing Credit finance disbursed by bank,Security under Packing Credit finance to Exporters,Margin requirement in Packing Credit under international business,Interest rate of Packing Credit Loans,Importance of Packing Credit to Exporters,Period of allotment of Packing Credit to Exporters,How is limit of packing credit fixed,How to repay and close packing credit finance and Other mechanism involved in Packing Credit in Export Business. You can click here to read – Packing Credit, how important in Export trade? Also read - Export Bill Discounting formalities with Bank. 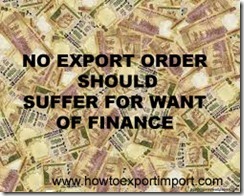 What happens, if Bank not received money from buyer after discounting of export bills? Have you satisfied with this article about packing credit to exporters? Would you like to add more information about packing credit – a pre shipment finance to exporters? Share your experience in handling packing credit procedures and formalities extended to exporters. Comment below your thoughts about this article – What is packing credit in Exports and how does packing credit work as a pre shipment finance to exporters? abhijit bhattacharya: On 03 December 2013 Our company is exporter of Rice to Dubai for last six months with a export turnover of 2.5 lakhs u.s.dollar. We have got a very big consignment of sugar for which we need packing credit.Bank authorities telling us that the required stipulated period of business is 1 year after that they can allow the packing credit.In this situation waiting for another six months will cause the loss of order .Please guide and help us to mature the order. Surendran Kollerath: On 09 March 2014 Hi Majid, Please ready articles in this website about discounting/negotiation procedures and packing credit. Rosang Imsong: On 15 March 2014 Sir please explain the procedures of packing credit. AL TOUSIFF : On 11 August 2016 My self Shaik Tousiff Hussain, and iam running a Minerals based export company. I have been following your articles on Export-Import and they were really helpful to me. I'm unable to understand how to get PCFC without security. All the banks are asking for security for any type of loan I approach them. Harish Dodla : On 17 July 2017 I have got an order to export order of Rice from Andhra Pradesh (India) to Dubai, please guide me with the below mentioned information - How to apply for Export Packing Credit Limit - How much will be the credit interest - Repay Tenure - Documents required to apply EPCL I am from Nellore (Andhra Pradesh), enquired with SBI bank they don't know much about this. nitinbahirat25: On 14 March 2018 Respected Sir, Sir we need packing credit against sight L.C. c to send shipments to Dubai commodity vegetables and fruits.